For decades, marijuana policies have devastated hundreds of thousands of our state’s families and communities. In 2013 alone, more than 24,000 marijuana possession arrests were made by law enforcement, making criminals out of otherwise law-abiding people and imposing a lifetime of punishment on those who are convicted. Marijuana laws have also been used to support biased policies like stop and frisk, racial profiling and the deportation of people of color. It’s time to right these wrongs. Marijuana legalization is on the upcoming legislative agenda in New Jersey. At this point, it is not a question of whether marijuana will be legalized, but a question of when and more importantly, how. Until recently, marijuana legalization laws have inadequately addressed the lasting impacts of decades of harsh marijuana prohibition and punishment, but New Jersey must do better. In order to ensure that marijuana legalization legislation in New Jersey is truly fair and equitable, legislation must be grounded in racial and social justice. 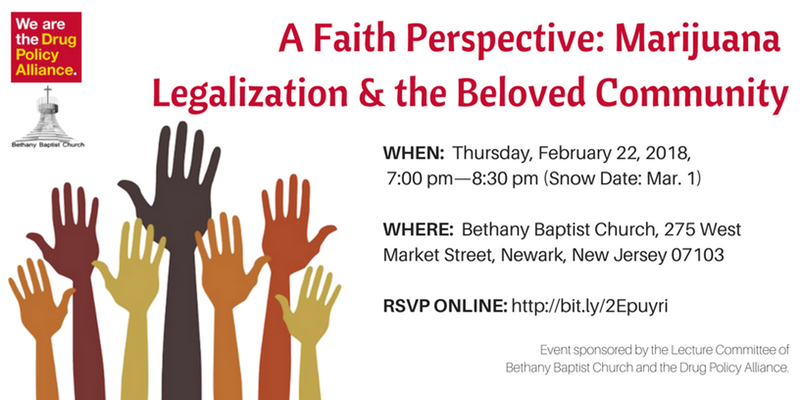 Please join us on Thursday, February 22nd (snow date: 3/1) to learn more about the moral case for marijuana legalization in New Jersey and how to ensure that legalization legislation provides a level playing field and addresses past harms to the communities most impacted by marijuana prohibition. 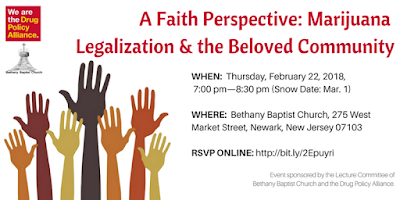 This conversation, sponsored by the Lecture Committee of Bethany Baptist Church and the Drug Policy Alliance, will take place at Bethany Baptist Church, 275 West Market Street in Newark from 7:00 pm – 8:30 pm. For more details, please see the flyer below. The event is free, but space is limited, so please register now. Please help us spread the word about this important event by forwarding this email and sharing on Twitter. We look forward to seeing you there!